Sabarimala temple protest Updates: At least 72 people have been arrested so far for violating the prohibitory orders in the Sabarimala temple vicinity since last night's police crackdown. Sabarimala temple protest Updates: At least 72 people were arrested for violating the prohibitory orders in the Sabarimala temple vicinity since last night’s police crackdown. The police action has promoted massive protests by the BJP and right-wing workers. The Congress party has also termed the police actions against ‘genuine devotees’ unwanted. However, Minister for Devasoms (Temples) Kadakampally Surendran has backed last night’s police action saying it was not the pilgrims but RSS goons. Meanwhile, scores of protesters also gathered outside the residence of Chief Minister Pinarayi Vijayan and are staging protests against the police action. Earlier today, Union Minister KJ Alphons, who hails from Kerala, visited the hill shrine and slammed the LDF government over its stand on the Sabarimala temple issue. He said that situation in the temple town was similar to emergency and there was no need for imposition of Section 144. Massive security arrangements have been made at the shrine in view of the rising protests. Today morning, a PTI report said, a few devotees turned up to offer prayers when the doors were opened. The temple doors were opened for two-month long pilgrimage on Friday, third time since the Supreme Court’s landmark verdict on September 28 to lift the centuries-old ban on entry of women of all age groups. 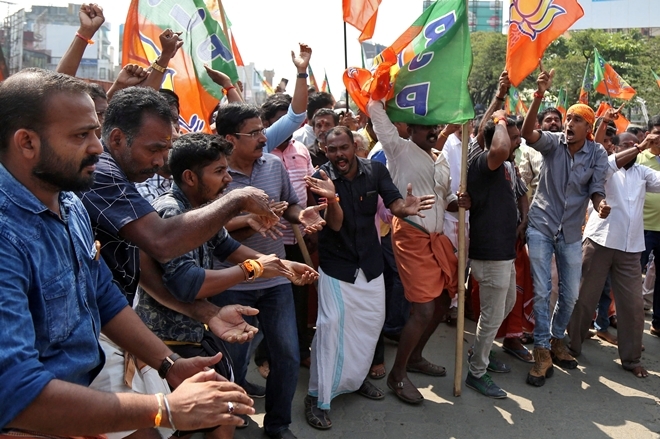 Activists of the BJP, Yuva Morcha and other right-wing outfits Monday stepped up protests across Kerala against the late night police crackdown at the Sabarimala Ayyappa temple complex and the subsequent detention of 69 people. In a strong reprimand, the Kerala High Court expressed its displeasure over the manner in which Ayyappa devotees were dealt with by the police at the "Sannidhanam" (temple complex). Who are the three women? Leader of Opposition in Kerala Assembly Ramesh Chennithala said that they will be forced to violate the prohibitory orders that are now in force in and around the temple town. The Congress leader said that prohibitory orders should be withdrawn immediately as there is no need for it. 'Vijayan has made a complete mess of the Sabarimala pilgrimage season as the police is creating havoc and has turned the temple town into a terror zone. Vijayan has lost control...,' Chennithala said. The Supreme Court had on November 13 refused to stay its verdict and on Monday made it clear that it will not reconsider its decision as the case has been posted to be heard on January 22. The court also said that it was not passing any order staying its previous verdict on entry of women between 10 and 50 years of age. The Congress-led United Democratic Front has decided to intensify its protest and demanded that the Chief Minister Pinarayi Vijayan give up the Home portfolio. The Sabarimala temple doors were opened on November 17 at 5 pm for two months pilgrimage, third since September 28 judgment of the Supreme Court. The temple town has witnessed protests by Hindu groups since then over allowing women of all ages to enter the temple. Travancore Devaswom Board has moved to the Supreme Court seeking more time to implement its verdict allowing women of all age groups to enter the temple. The move assumes significance as the temple had opened on Friday evening for the 64-day annual pilgrimage season, however, the stand-off continued over the entry of menstrual age women into the shrine following the top court order. The government has no other way out but to implement the Supreme Court verdict, said Vijayan. The chief minister said that post the apex court verdict, it has the constitutional responsibility to provide security to women devotees reaching the hill shrine to offer prayers. Vijayan urged the media not to fall prey to propaganda that the government was against devotees. Kerala Chief Minister Pinarayi Vijayan has justified last night's police action against protesters. At the state conference of the Kerala Union of Working Journalists (KUWJ), he said that those who tried to create trouble were arrested and accused the RSS of implementing its agenda. "They were not Ayyappa devotees. RSS workers were camping at Sannidhanam with a motive to create trouble. The government cannot let anyone create trouble at Sabarimala," Vijayan said. The CM reiterated that government was with devotees and said that it was being targeted for trying to implement the Supreme Court order. A group of five women lawyers has challenged the restriction on women of menstruating age in the Supreme Court after the Kerala High Court in its order upheld the centuries-old restriction. The HC had ruled that only the priest of the temple was empowered to decide on traditions. The rule that is at the centre of a row is - Rule 3(b) of the Kerala Hindu Places of Public Worship (Authorisation of Entry) Rules, 1965. Senior Advocate Indira Jaising had represented that petitioners. She had argued that restrictions are against Articles 14, 15 and 17 of Constitution and custom is discriminatory in nature. Kerala Minister for Devasoms (Temples) Kadakampally Surendran has backed the last night police action. He said that it was not pilgrims but RSS goons who had taken over the Lord Ayyappa shrine. "Unlike he (Alphons) who was a senior IAS officer, who later became a legislator with us and then moved on to greener pastures, am only a simple political activist. But he should not have said things without knowing facts," Surendran said. According to a Manorama news report, Kerala High Court has admonished the state police, stating that excess police intervention at Sabarimala temple is not required to implement an apex court verdict. Over 70 pilgrims have been arrested since late last night from Sabarimala temple. According to police, they had violated prohibitory orders imposed in the vicinity to prevent mass gathering. As news spread about the arrests, scores of protesters assembled near Chief Minister Pinarayi Vijayan's residence in in Thiruvanathapuram and shouted slogans. Scores of Lord Ayyappa devotees today staged a protest at Nadapanthal area after polie didn't allow them to stay overnight. They were later later detained by police. The Supreme Court has ruled out early hearing on the review petitions filed before it. The court said that it has aleary fixed January 22 as the hearing date. Meanwhile, the TDB which manages the temple, has moved a petition in the court seeking more time to implement its order to allow entry of women of all age groups inside the hill shrine. Difficulty in identifying the cops who conducted the arrests the previous nights. Pathanamthitta DYSP S Rafeeq has informed Kerala High Court today, as per Manorama online news report. "The visual footage is not clear," he told the court, as per the local news report. 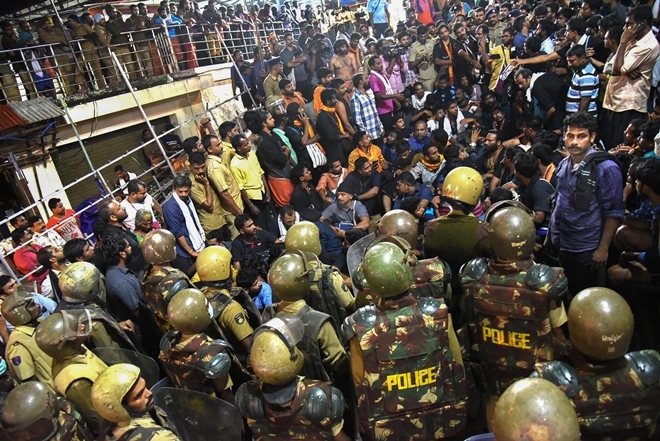 A PTI report said that the BJP is demanding a judicial probe into the police action last night when 68 people were taken into custody from the Sabarimala temple. The Congress has also slammed the Kerala government over police action. Opposition leader Ramesh Chennithala said that Kerala was under the rule of Hitler, ading that arresting real devotees could not be accepted. According to a PTI report, the sanctum sanctorum of the Sabarimala temple was opened on Monday morning with very few devotees turning up early. Meanwhile, protests are being held across Kerala against the detention of nearly 70 people last night. Senior Congress leader and Opposition leader in the Kerala Assembly Ramesh Chennithala attacked Chief Minister Pinarayi Vijayan over the police action against Lord Ayyappa devotees last night and asked if Kerala was under the rule of Hitler. He said that LDF government was trying to brand Ayyappa devotees as Sangh Parivar activists. "It is police high-handedness. Innocent devotees who sought shelter at Valiya Nadappandhal (covered pathway) were also arrested. They all are not Sangh Parivar activists who reached there to create trouble. Is Kerala under the rule of Hitler (Nazi ruler Adolf Hitler)," Chennithala said. "Arresting real devotees, who climb the hills to offer prayers, could not be accepted," he added. "The situation is quite bad, not even basic hygiene facilities are in place for pilgrims, it is clear that the state government has done nothing for the," Union Minister Alphos said after visiting the shrine. He also criticised the police actions inside Sannidhanam last night, stating that he fails to understand why the cops clamped down the prohibitory orders and he also said that Lord Ayyappa devotees are not extremists to be treated with force. The protests took a violent turn when unidentified bike borne pelted stones at a moving bus in Pathanamthitta. Union Minister KJ Alphons said that there was lack of basic facilities at the Sabarimala temple complex. According to his claim, the BJP-led Central government had provided Rs 100 crore for putting up various facilities at temple but nothing much was done on the ground. Alphons hails from Kerala and on a visit to the shrine which comes hours after hundreds of people held protests against police action. As many as 68 people were taken into preventive custody on Morning after fresh protests broke out near the temple vicinity. According to a PTI report, 68 persons had been taken into preventive custody from the temple complex and brought to the Manniyar camp early this morning. Their details are being verified and their arrests have not been recorded yet. The Bharatiya Janata Yuva Morcha, the youth wing of BJP, has called for a state-wide protest today against the detention of right-wing leaders including BJP's Kerala unit general secretary K Surendran. On Sunday also, the saffron party had observed a protest by blocking highways across the state. The opposition parties -- BJP and Congress in Kerala are protesting against the Pinarayi Vijayan government's stand on the issue. Meanwhile, the BJP and RSS have decided to strengthen their presence in the temple town and have asked its cadres to arrive as pilgrims. Union Minister KJ Alphons has slammed the Kerala government over its attitude. Speaking to media, he said that the LDF government has failed to deal with the situation and said that the situation at the shrine was worse then emergency. He even added that there was no need of imposing Section 144. The famed temple of Lord Ayyappa and surrounding areas have come under unprecedented security since the doors were opened for the third time after Supreme Court's landmark verdict on September 28. The temple will remain open for a period of two month this time. It is expected that in this season, lakhs of devotees will throng temple to offer prayers to Lord Ayyappa. Meanwhile, the Supreme Court has said that it will hear review petitions on January 22 challenging its September verdict. Union Minister KJ Alphons on Monday said that the state cannot use police against Ayyappa devotees. Speaking on the restrictions, "I fail to understand why the Kerala Police has clamped prohibitory orders. This is not the way things should be handled. Sabarimala pilgrims are not extremists. You cannot use force in this place." Reports suggest that over 60 pilgrims have been arrested from Sabarimala Temple after they failed to comply to restrictions in place at the shrine. Sabarimala: Police personnel stand guard as the Sabarimala temple opens for a two-month long pilgrim season, in Sabarimala, Friday, Nov. 16, 2018. (PTI Photo) (Story no. MDS18) (PTI11_16_2018_000157B)Last week on Friday, Sabarimala temple opened amid tight security for the first two-month-long pilgrim season since the Supreme Court allowed the entry of women. On the day the shrine opened, a stand-off happened between Lord Ayyappa and activist Trupti Desai, who wanted to offer prayers at the shrine but was blocked.